Duke’s Alehouse in Crystal Lake features food and specialty beers while using local and organic products. One page of the menu lists local farmers Duke’s buys from and the items they provide for the restaurant. General Manager and Chef Zak Dolezal is committed to sustenance. We dined on the outdoor patio just off Main Street and across from the train station in downtown Crystal Lake. The shade from the umbrellas, gentle breeze and greenery added to the pleasant atmosphere. Music played in the background and was not overwhelming. The lunchtime crowd included professionals dressed in office wear. The beer menu includes an extensive list of microbrew beers grouped by varieties. Our server was well versed on the offerings and suggested specifics after asking about our tastes. We choose a Weihenstephaner Hefeweizen with an orange slice and Bell’s Two Hearted Ale. Appetizers looked tempting though we took a pass this visit. The roasted beet salad with endive, blue cheese and candied pecans was a hit. We asked for the bacon dressing on the side making this a vegetarian salad. On to the vegetarian entrees. 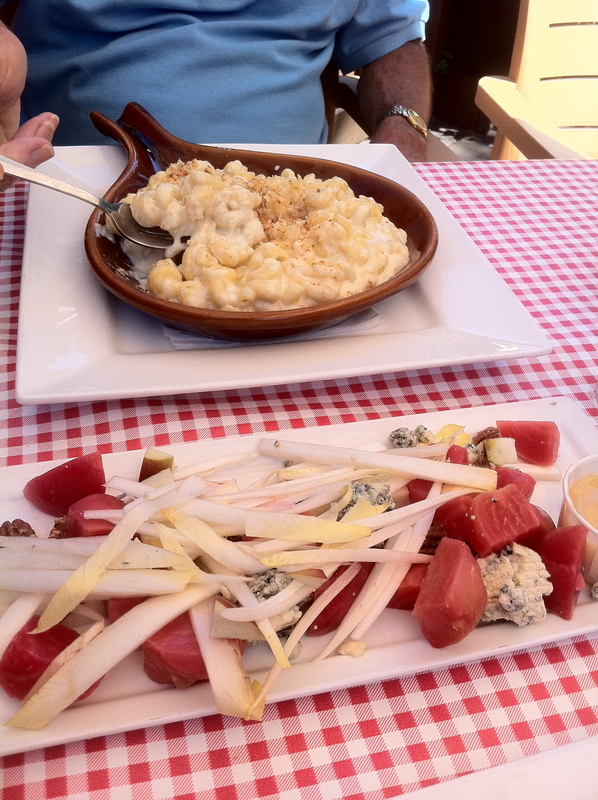 The baked mac and cheese was creamy and hot. 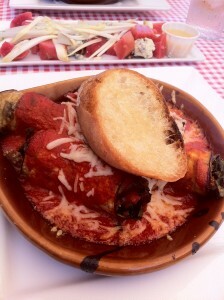 The grilled eggplant Parmesan came stuffed with bulgar wheat and kale, topped with tomato sauce and Parmesan cheese. Both were delicious. Stop at Duke’s to celebrate Meatless Monday’s where all vegetarian entrees are half price. Vegetarian and vegan items are clearly noted on the menu. Dolezal and Duke’s focus on sustainability includes hosting a monthly Green Drinks meet up.